I’d been secretly chewing on the same question for years. And though there’d been plenty of personal experience and all sorts of direct engagement with the light of dreaming while tending those dreams that made their way into my practice, the question also involved how to talk about it in ways that would not come across merely as pronouncement. So, in the weeks leading up to that light retreat, and not wanting to talk through my own hat, I attempted something of a response. Revisiting the question now, it’s surprising to once again discover how very difficult it is for some folks to see through the content of dreams. Either folks are deliberately and exclusively focused on the contents of dreams (which is fine, of course, so long as folks are aware they’re doing this), or perhaps, in the same way that it can be difficult to see the forest for the trees, the light of dreaming is simply too close to be noticed? 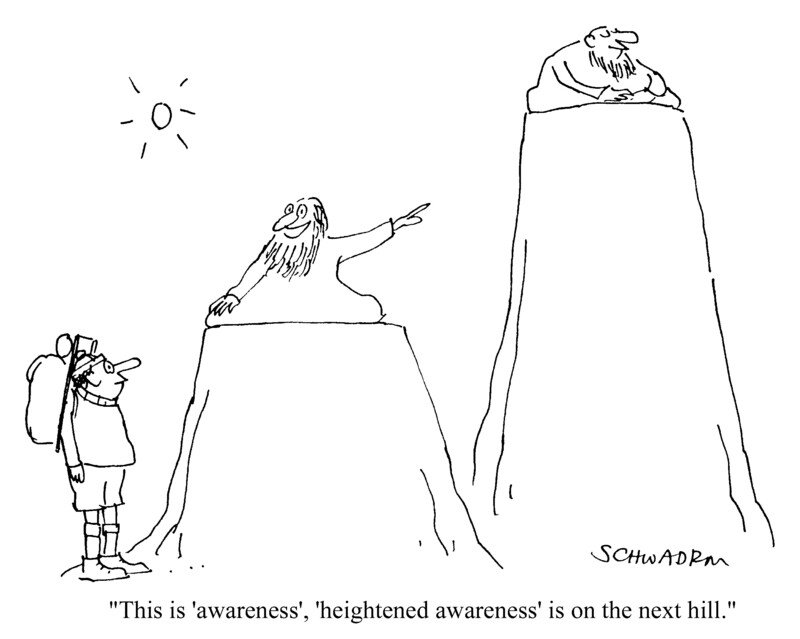 Thus it’s not uncommon to find things like: “Light represents the truth in dreams,” and, “To see a bright light in your dreams indicates that you need to move toward a higher level of awareness and feeling.” This last one cracks me up. Like something out of a cartoon . . . But the light of dreams in Robert Sardello’s question is not alluding to the illuminated content of dreams, to seeing a bright light in our dreams; he’s asking after the light of dreams, that is, to the source of light and the lit-up phenomenon of dreaming per se. Let’s see if we might shed some light on the subject. is what my brilliant, bearded and bespectacled high school physics teacher, Mr. Fedorak, delighted in reminding his students, while attempting to highlight the difference between luminous and illuminated objects. Luminous objects like the sun, Mr. Fedorak explained, are objects that generate their own light. The moon, on the other hand, he instructed, was a fine example of an illuminated object because it’s only capable of reflecting light. Further, as not one of us was accomplished enough to generate light in the visible region of the electromagnetic spectrum, all of us, according to Mr. Fedorak, and indeed all human beings, fell squarely into the second category, as objects of illuminated light along with the moon. You remember the light/sight theory involving luminous and illuminated objects that we were taught in high school physics, right? It states that the sun generates enough light to illuminate objects on Earth during the day—blue skies, white clouds, green grass and so on—and that everything seen is as a result of light from the sun reflecting off illuminated objects as it makes its way to our eyeballs. Without light from a luminous source, the theory goes, illuminated objects could not be seen. It is only by reflection that we, as well as most of the other objects in our physical world, can therefore be seen. Without light there would be no sight. Not So Fast, Mr. Fedorak. We’re brilliant after all! Weirdly, scientists in Japan have recently discovered bioluminescence in humans. And, though it’s no where near the amount of bioluminescence emitted by creatures like fireflies and jellyfish — indeed it’s a thousand times weaker than the human eye can perceive — researchers have developed a way to record human bioluminescence using ultra-sensitive cameras. Schematic illustration of experiemtnal setup that found the human body, especially the face, emits visible light in small quantities that vary during the day. (B) is one of the test subjects. The other images show the weak emissions of detectable light during totally dark conditions. The chart corresponds to the images and shows how the emissions vary throughout the day. The last image (I) is an infrared of the subject showing heat emissions. It’s the forehead, cheeks and neck in humans that emit the brightest light. And emissions follow a certain rhythmic pattern, with the highest intensity of light occurring late in the afternoon and the lowest intensity occurring late at night. 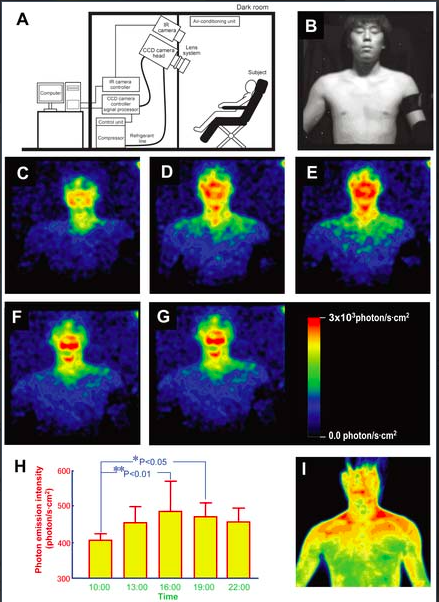 Further, and perhaps even more unexpectedly, the brightest areas of human bioluminescence do not correspond to the brightest areas of the same human body when thermal images are taken. But now whether we’re luminous or illuminated or perhaps some combination of both, the problem with all of this kind of thinking is that human beings are not merely objects in space bumping up against other objects in space; we’re living beings. The material ‘object’ aspect of us has blinded us to the reality that this is but one of many aspects of what it is to be human. So both the ray light model of our high school physics classroom and the recent discovery of human bioluminescence leave us decidedly in the lurch when it comes to discovering the source of light in dreams. What nonsense! Never mind that folks ‘lose’ this so-called ability to dream all the time. All dreamers, including prolific dreamers and those with an avid dream life, experience extended periods of not being able to recall dreaming from time to time. There’s no need therefore to pathologize this, of course, but we’re currently in a pathologizing culture, where human beings are imagined as complex things that invariably have something ‘wrong’ with them that needs fixing. Health is therefore imagined as an ‘absence of symptom.’ And because everything is regarded in terms of cause and effect, we’ve been reduced to subjects of various ‘conditions,’ ‘disorders,’ and ‘syndromes’. Now it may well be true that dreams are indeed transmitted through the area of the brain that’s associated with visual processing, emotion, and visual memories. 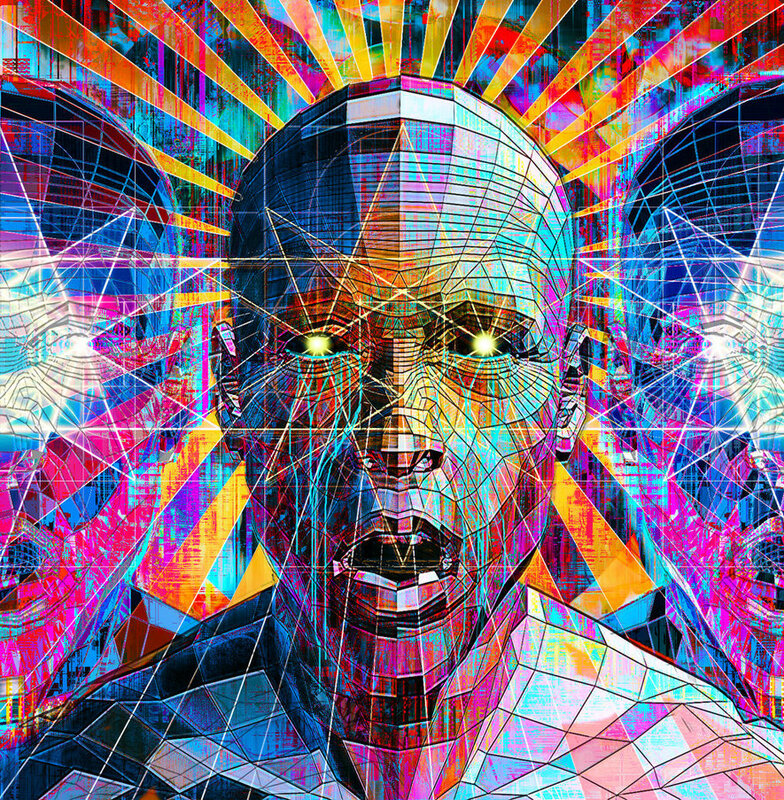 However this mechanical way of thinking throws us back into our bodies as things, as objects in space, while only really accounting for the brain ‘mechanics’ of dreaming. Digging, Digging, Digging Deeper . . . Similarly, when neuroscientists dig even deeper, for example, when they’re discussing the dopaminergic system of the brain that is required for dreaming, they tell us that dopamine directly blocks the action of the pineal gland which in turn blocks the formation of melatonin which then leads to REM sleep, and, voilà, the result is dreaming. By activating pathways in the photosensitive ganglion cells of the retina that normally respond to light, and that are stimulated with a photopigment called melanopsin, the pineal gland responds in the same way that it normally responds to light and dark signals when we are awake. Thus, according to this model of things, the light we see when we’re awake is the brain’s response to melanopsin, while the light we see in our dreams is the brain’s response to dopamine. Again, this may well be true mechanically speaking, however, it quite deftly sidesteps the role of the “activator”—as if all of this is somehow quite magically happening in the mechanism of the brain without an operator, that is, on its own, the brain as a mechanical object in our heads, without something or someone or some force flipping the on-switch that activates everything. All of this reminds me of what it is for a woman to go into labor. Science can tell us every detail about labor, about what it is hormonally and what’s happening in a woman’s body and what the baby’s doing and so on, down to the smallest of details, but they cannot tell us what makes labor start. This is, I want to suggest emphatically, because it’s not WHAT makes labor start but rather WHO makes labor start. 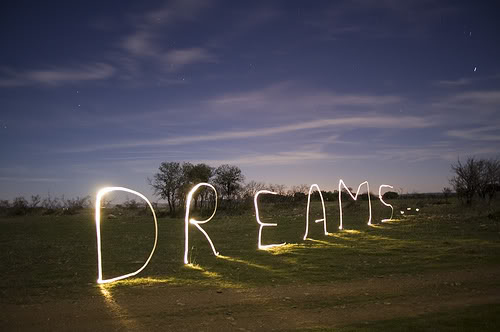 In the same way, dreams are not self-generated by various mechanisms of the brain, but by living presences. I’m not therefore refuting these mechanical theories or in any way suggesting that they’re incorrect, indeed, far from it; they’re simply incomplete. Further, it’s sometimes fantasized that, as science digs deeper into the workings of these mechanisms, it will eventually come to a complete picture of things. But this fantasy is rather like that old folktale where a group of blind men meet an elephant having never before encountered such a creature. 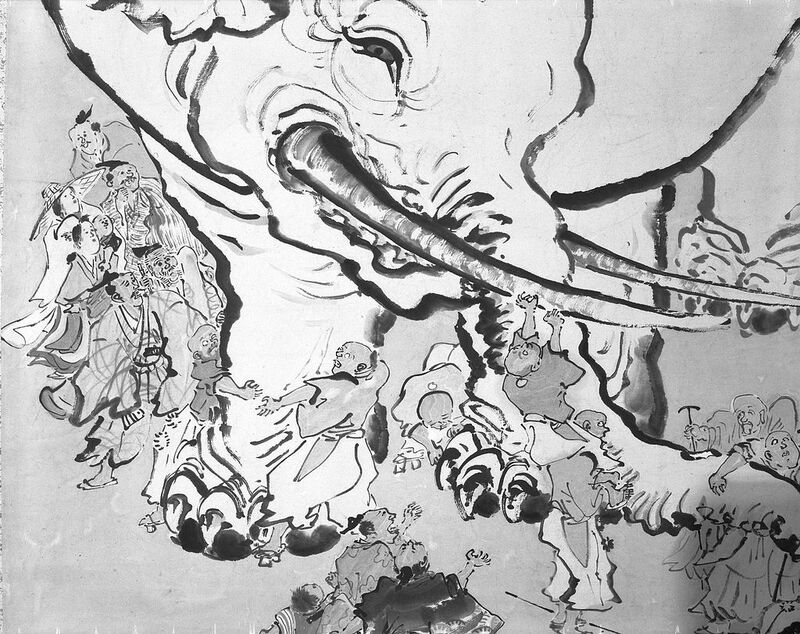 Each blind man touches a different area of the elephant’s body while coming to entirely different conclusions about what the creature is. And it isn’t until the men cooperate with one another and collaborate that they can “see” the whole elephant. But even this is not the whole picture if “seeing the elephant” is here reduced to what the creature is in terms of its biology, for no living creature exists in terms of its biology alone. So the deeper digging of neurologists will only lead to a more complete picture of the mechanical, neurological workings of things, not a complete picture. And yet, aren’t we somehow convinced that we are our bodies? Likewise, we have this mistaken but almost universally-endorsed notion that dreams are happening ‘inside’ us, that they’re playing out on little screens that are somehow located in the visual cortex of our brains. But we are not our brains any more than we are our bodies, as any dreamer can certainly attest. Reality or Where the Light of Dreams Really Comes From . . . So now, at the risk of sounding as though it’s merely pronouncement, let me at long last attempt to answer Robert Sardello’s probing question:Where does the light of dreams come from? From the one and single reality that is Light. We are beings of this Light, that is, we are light-bearers, dreamers. And this is revealed to us night after night in the dark, through the light of our dreams. When we dream, the light that is present touches us into being, revealing that we are always in the light, that we ARE light, and therefore that we can never be separated from it, except, of course, imaginally, when we’re ‘in the dark,’ that is, when we experience the various densities that make us feel separate. But all the time, all the time, all the time we are dreamers, only we’re not aware that we’re dreaming in the light of day because our bodies are densities of light that actually obscure this reality. The illusion of bearers of light independent from the source of Light has everything therefore to do with darkness, that is, with the density of matter and how this density convinces us that we are our physical bodies. The light of dreaming is doled out to us from the allotment of light we originally agreed to bear along with the Angel of our Being. In other words, we share the light of our being with the Angel of our Being, just as we share our darkness, that is, our physical bodies, which, as mentioned, are densities of light. To put it another way, we share our bodies with the Angel of our Being. And dreaming is the light medium through which we communicate with the Angel of our Being. Dreams illuminate the shared imagination between us and well as the shared imagination that we have with the source of Light. Symptoms of the body, therefore, are like the dream turned louder. In other words, symptoms are “located” bodily where the light we have been living off of—as part of our spiritual gift and allotment—has somehow been captured, where, in effect, we’ve crowded the Angel of our Being out of the picture, and where we’re perhaps imagining ourselves merely in terms of being mechanical, biological creatures instead of the light-bearers that we are actually. Oh course, you may not recognize what I’m saying as true, and this therefore may all sound as though it’s merely pronouncement instead of revelation, instead of as the result of a grounded philosophical education in the phenomenology of dreaming which is revealed by deeply and devotedly living into the question: where does the light of dreams come from? If this is the case, Dear Gentle Dreamer, I invite you, as Robert Sardello once invited me, to discover for yourself where the light of dreams comes from. Invite the question into your life as you might invite a guest into your home. And then please let me know what, if anything, is revealed. Meanwhile, in the coming weeks, I hope to illuminate how we are being sought as beings of light, and how our dreams therefore belong to an even bigger call and response picture. Dreamers, please stay tuned. Oh, and for those of you who may be interested, Robert Sardello is hosting another retreat in the Los Angeles area in November. For more information, please click here. Kind of like my dreams I’ve had right???? Yes, Laurie, exactly. When the creature that turned out to be Butterfly got your attention from way far away . . . but then as soon as you were able to recognize it as being a butterfly it changed into something else . . . oh, my goodness, it’s Lion now . . . but no sooner were you able to recognize it as a lion than it transformed again. And it took awhile then for the image of Shark to reveal itself. And all of this, it seems, is the Dreamtime, that is, the Light of Being, trying to move us out of a concrete, literal imagination that names things according to what we know, or what we think we know. 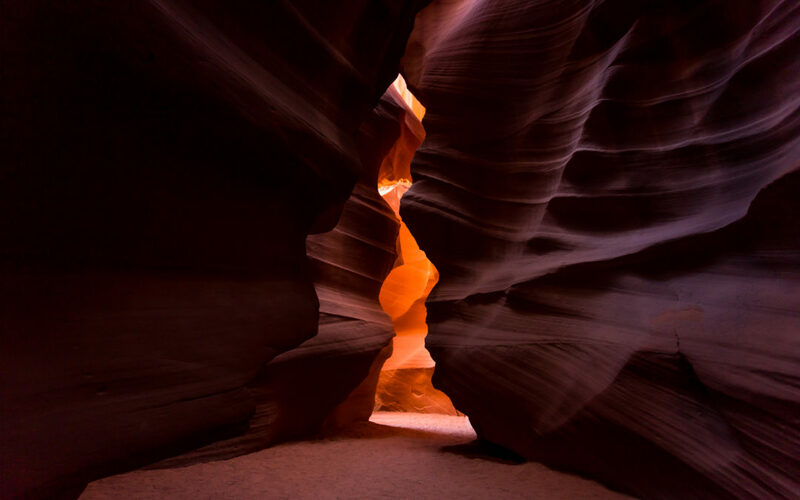 Astoundingly well written invitation to light and dreaming, Renee … thank you! Thank you, Jacque. I’m afraid the Village Explainer was a bit too present in the first two-thirds, with the Town Pronouncer showing up in the end there . . . but the whole point is to hopefully begin a conversation on the Light of Dreams. So thank you for taking the time to read this and comment. I am very grateful for your interest in and devotion to the art and practice of Dream-Centered Living. Renee, thank you for leading us into the exploration that came through Robert’s question re: where does the light come from? The dead mentor us now. They are the light. In our joining with them in dreams and in our waking awareness of the realms in which they live and move and have their being, we enter into a lit up future of an Earth full of light, for it is the Earth realms that we and they occupy together. What all of that is, is just beginning to unfold, it seems. Thank you, Linda, I’d take credit, but it’s actually Robert Sardello we need to thank. Yes, the dead do avail themselves to us as mentors. And they are part of the light, but so are we, Linda. We, that is, the so-called living, are not nearly as separate from the dead as we tend to imagine, or as it feels to us. We are all — the dead, the living, Earth, and everything else — aspects of light in varying degrees of density. Or, to put it another way, ‘there is only one Light, differentiated in multiple degrees of condensation and subtlety.’ Henry Corbin refers to this as spiritual realism, as concrete spiritualism rather than something abstract. Thank you, Laurie. The “she” you’re referring to, it seems, is the feminine, wisdom aspect of things, which mostly defies the kind of “understanding” we go after with our brain thinking, that is, “about” things. We are guided, trying to be guided, by light in the dark of night, in our dreams or when we’re ‘in the dark’ so to speak, just as we’re trying to be guided in the light, whether it’s the light of day or the light of our being. Everything we see and experience is an aspect of the same light. Everything is therefore created out of the light in varying degrees of density, and everything therefore depends on the quality of light we are, that is, on the quality of light we bear as light-bearers for the sake of the Angel of our Being.